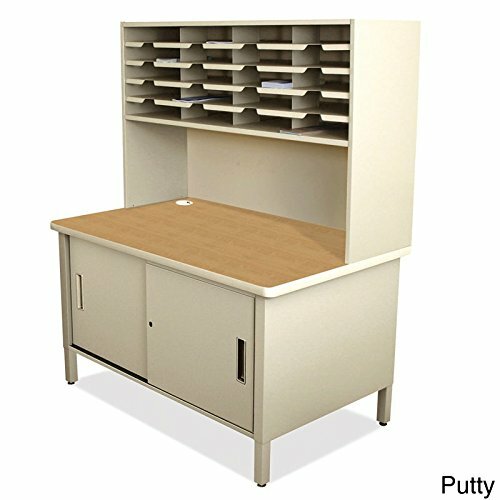 UTIL0070/UT Finish: Putty Features: -Marvel®'s mailroom shipping tables and mail storage centers can help create a custom solution to help organize the mailroom. Every mail or shipping area needs specialized mailroom equipment that supports meter machines, scales, printers and more. With features such as a high pressure laminate work surface, steel construction, and a choice of colors, these units are built to last. Textured powder coat is one of the most durable high quality finishes.. -Mailroom collection. -Material: Heavy duty steel. -20 Fixed sorter pockets. -Under worksurface lockable storage cabinet. -Adjustable interior shelf in each cabinet. Number Of Compartments: -20. Country of Manufacture: -United States. Product Type: -Mailroom organizer. Dimensions: -Minimum height: 60". Overall Height - Top to Bottom: -68". Overall Width - Side to Side: -48". Overall Depth - Front to Back: -30". Overall Product Weight: -205 lbs.